Total Financial Solutions (TFSA) is one of Australia's largest and most successful, independently owned dealer groups. In mid 2008, we were engaged by TFSA as part of a comprehensive rebranding exercise. We were approached by Walden Wood Group, TFSA's marketing partner, to develop a new website for TFSA, with fresh information architecture, design and branding. We developed a customised Kentico CMS which utilises sophisticated user authorisation and provides advisers with convenient, single-sign-on access to commission data. 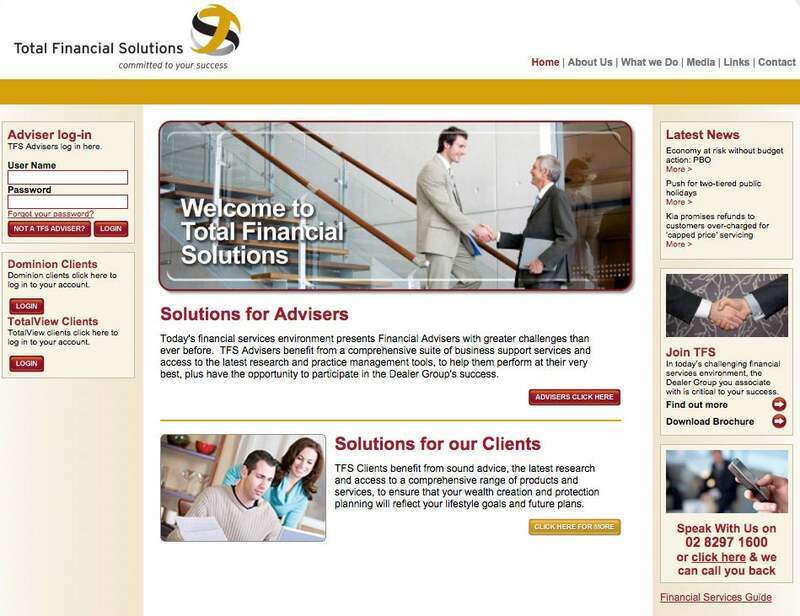 We also collaborated with TFSA's IT infrastructure partner, Inform Consulting, to integrate the site with existing back-end systems. The new system features a custom workflow process to give TFSA greater control over content publishing. We also provided training and support TFSA staff, so they could manage their content independently.